Editor’s note: Neeraj Agrawal is a general partner with Battery Ventures in Boston. “What does it take to build a billion-dollar SaaS enterprise-software company?” I hear this question a lot in my work as a tech investor, and it’s incredibly tough to answer. I bet mountain climbers feel the same way when they’re asked how they conquered a major summit. The answer is both incremental — you succeed by placing one foot in front of the other, of course — and more pragmatic, in that the journey is always broken into multiple, distinct phases. You don’t climb all of Mt. Kilimanjaro in one day, and you don’t build the next SaaS standout quickly, either. Instead, you shrink your focus and keep your goals clear-cut then recognize what the next level looks like and scramble like mad to get there. I started thinking about how my job in venture capital resembles mountain climbing thanks to a very unlikely person: my mom. She and my father immigrated from Rajasthan, India, to Queens in the mid-1960s. My parents are both smart, hard-working, practical people who don’t really understand what I do at work. I’ve described my work so many times to my sweet, tiny mom (she’s just 4’11”) but she can never remember exactly who I work for. Recently at a party, she proudly told her friends: “My son works at Battery Adventures.” Her friends smiled, but they were disappointed that I was neither a doctor, like my dad, nor working at a brand-name bank like Goldman Sachs or Morgan Stanley. Her remark got me thinking. Maybe she captured my career better than I’d realized. Maybe the right way to think about building a company is going on an “adventure,” not merely a “venture.” And perhaps my role as a VC is that of an adventure travel guide: someone who’s climbed the mountain many times before, who knows both the terrain and the phases of the climb intimately, and can serve as a guide for others brave enough to take up the challenge. So I’d like to share some stories and advice from my personal travel log — call it a tale of “adventure” and a guide to the mileposts entrepreneurs will need need to traverse to reach their summit: a billion-dollar valuation. I believe there are seven key phases in SaaS companies’ go-to-market success. 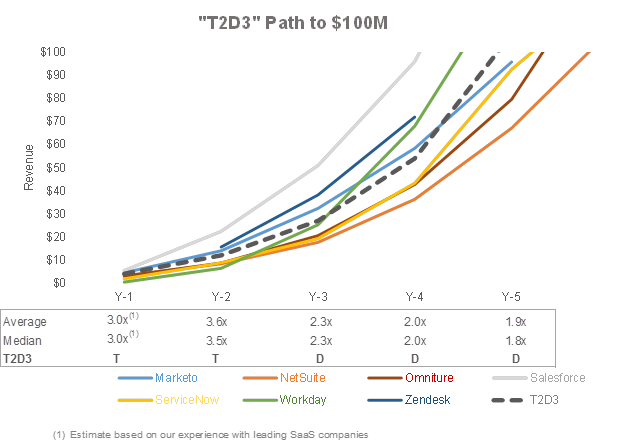 Most of the phases center around a mantra I call “triple, triple, double, double, double,” (T2D3 for short), referring to a company’s annualized revenue growth. This is not the only growth path to SaaS success, as enterprises like Cornerstone, ExactTarget and SuccessFactors have shown, but it is one sure-fire way to get there. Each phase demands a different focus, such as adjusting your sales process; growing your team and your organization strategically; and expanding internationally. You’ll notice that I specify “go-to-market” because there are many other critical phases of SaaS company growth, as well. They include selecting a co-founder, choosing a capital partner, developing a scalable product architecture and fostering a winning company culture, among others. Here, we’re focusing only on the mechanics of the “climb” itself. So grab your outdoor gear — we’re hitting the trail and heading to the peak. Phase 1: Establish a great product-market fit. This involves finding and prioritizing customer pain points, then aligning your product to address those pain points precisely. Many founders ask me how they’ll know they have product-market fit. Unfortunately, there’s no clear test here. I usually ask several prospects or customers in a specific sector to describe their pain points. When I hear consistency across the sample set, I know we’re there. Once the product is developed, it’s easy to run tests to see if customers are actually realizing a benefit. It’s also critical this pain be among the top one or two pain points for the company’s target customer. I’ve noticed over the years that customers never really get to priority three on their list. Phase 2: Get to $2 million in ARR (annual recurring revenue). In this phase, the founders are closing all the new sales, so the name of the game is landing the “right” starter clients and perfecting your sales pitch and funnel strategy. Assuming your average deal size in the $30K-$80K range, this means getting to 30-60 customers. Completing this phase usually takes a year or two. Phase 3: Triple to $6 million in ARR. I often see SaaS founders take two paths to reaching this first “triple” goal. In the first scenario, which I call the “hero” approach, the founders close just about every deal. That’s a tenacious strategy, but not scalable. Maybe one day I’ll go back to medical school and realize my father’s dream. Until then, I’m happy to help company founders achieve their dreams. And bless my mother for highlighting in her own way that you can build a great career through a series of memorable “adventures” with standout entrepreneurs.